It doesn't matter whether it's single or multiplayer, you should reserve a lot of space on your drive. 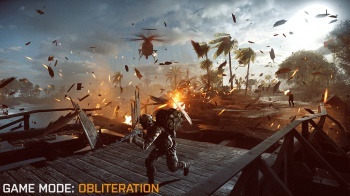 The first time you start Battlefield 4 Xbox 360 version, regardless which of its two discs you use, you'll need to install 2 GB of game content. Not impossible, but then, DICE suggests, you should go further. The Multiplayer disc has 6.6 GB of additional content, and the Single Player disc has 5.8 GB installation content. DICE "highly recommends" you put all these on your drive for best performance, which means Battlefield 4 will be taking up about 14 GB, more or less, before you shoot even one Tango. It's not that bad, when you remember Battlefield 3 had similar issues. That one wanted 4 GB memory for best performance, and took up 20 GB hard drive space for the disc version; 25 GB, if you went for digital distribution. Battlefield 2 was much more modest, at 2 GB recommended for best performance plus another 10 GB hard drive space, but then it dates to the halcyon days of 2005, when the world was young, and so were you. Battlefield 4 is due October 29th for PC and current generation consoles, slightly later for the next generation crowd.